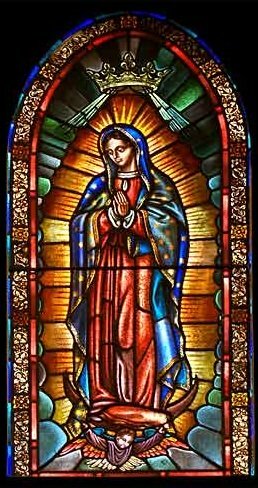 Our Lady of Guadalupe – Solar Mother of the Universe, Queen of Heaven, Mary and God. Has She any connection with Miriam of Nazareth? Fairly typical of Catholic critics of this site is the following comment on the Filianist revision of the Hail Mary prayer, and specifically the line Hail Mary, Mother and God. You forgot the word "of" which properly directs a person to the truth. "Hail Mary Mother of God, the Lord is with you (within your body/pregnant). Blessed are you among women and blessed is the fruit of your womb, Jesus....." The word of God does not read "Hail Mary mother God" Deception is apparent in your belief system. "Holy Mary, mother of God, I pray that you would, as you always do, point the way to your son Jesus in such a way that these people will truly see the blessed trinity, Father, Son, and Holy Spirit. We are not sure how the writer can imagine that we forgot the word "of", since the article goes into great detail about why each of the changes was made. And since everything is explained very carefully, we cannot see how – whether one agrees with us or not – anyone can suppose that any kind of deception is practised or intended. This site has many pages on Lady Mary (perhaps more than on any other single subject) and few people can be unfamiliar with the idea that the Image of Mary is that of the Supreme Deity (if you are, start here). What needs to be specifically clarified is the nature of the "disagreement" between Christians who say "Mary is just the mother of Jesus" and Déanists who say "Mary is the Image of Dea preserved in patriarchal Christianity". The long-lived gods are foolish. Gods like Indra, which, to the Hindus, are Angels – i.e., the multiple Powers of the Single Absolute – are, in the cosmology of Buddhism, titans. They are extremely long-lived (but not immortal) beings who occupy a paradise by virtue of karmic merit. Eventually that merit will expire and they will be thrown back onto the ever-turning wheel of samsara. To say that they are "foolish" is not intended as an insult, but as a technical description. For all their power and bliss, they are not axial beings like maid, and therefore they have not the power to pursue Enlightenment ("Nirvana"), which is the only true Wisdom. This may have been initially influenced by an early-Buddhist perception of the then pre-reformed Hinduism as having degenerated into a vulgar polytheism, which has been defined as "atheism with titans" (see our article What is Polytheism? for more on this). What we are seeing here is that the Angel of one spiritual perspective is the titan of another. Since Buddhism is a different spiritual perspective, it does not require an Angelology in the way that Hinduism does. Its view of the Absolute is more "subjective", and it tends to concentrate on the Immanent Absolute rather than the Transcendent (this is a vast oversimplification, and Buddhism, like all authentic Traditions has come to encompass, in its own fashion, every aspect of Truth over the course of its many developments – but the simplification will suffice for our current purposes). To take another example, Islam reveres Jesus and accepts the Virgin Birth and the miracles. But it reveres him as a Prophet and emphatically denies that he is in any sense Divine. To call Jesus God is as heretical in Islamic terms as to call Mary God is in Christian terms. What we have in each case is a different spiritual perspective, a different spiritual economy. It is the same with the Déanist view of Mary and the Christian view. It is pointless to ask which is "correct" as it is to ask if the white liquid that we drink is "really" called "milk", "leche" or "lait". But let us note that even within the Catholic fold, for centuries, Mary has been worshipped as Our Mother God, and despite the official denial, the Church has quite deliberately sought to assimilate worshippers of Dea into the worship of Mary in the hope of ultimately fully converting them (or at least their descendants). This took place countless times in the ancient world, but a more modern example is that of Our Lady of Guadalupe, Who appeared to a member of the deposed Aztec aristocracy (not a humble shepherd as some later legends recount), demanding that a shrine be built to Her on a hill where an Aztec Temple to Dea had been burnt down by the Spanish. At no point did the Lady say She was the Christian Mary, nor did the Church have any good reason to believe She was that Mary; but they did see an excellent opportunity to bring Aztec believers (at least nominally at first) into the Catholic fold. So the great shrine to the Lady was rebuilt. If the choice is between worshipping Dea inside or outside the Church, then the church would prefer inside. But if the choice is between worshipping Mary as God or as an adjunct to a male god, then the Church would prefer the adjunct. So the Church has always had to play a double game – leaving aside the fact that it is playing the game with living Divine images, which have a spiritual life of their own and tend to reassert their real meaning. The official position of the Catholic church is that there are three forms of worship. There is dulia which may be accorded to saints and angels – beings below God. There is latria which may be accorded to God alone (hence the term idolatry – according latria to idols or beings below God). There is also a third form of worship called hyperdulia which may be accorded to one being alone: Lady Mary. In practice, many people down the ages have accorded latria to Lady Mary because Her imagery and attributes are so obviously Divine. The title "Mother of God" clearly implies that She is anterior to, and the Source of, any other expression of Deity even if it is explained away as meaning merely "the mother of the human incarnation, Jesus" (why not, then, say "mother of Christ"?) In any case, how easy is it to gauge the difference between hyperdulia and latria? The position within the Catholic Church, then, is a little more complex than is officially admitted, but there is no doubt that officially, Mary is as non-Divine in Christianity as Jesus is in Islam. Are Christians and Muslims even talking about the same Jesus? More germane to our present discussion, are Déanists and Christians talking about the same Mary? The answer to that is, straightforwardly, no. Most Déanists do not believe that the Lady Mary was ever incarnate as a Jewish woman in the first century of the Common Era. They believe that the woman in question certainly existed, but that the association of her with the Image of the Queen of Heaven is simply an "historical accident". The Queen of Heaven is no more Miriam of Nazareth than the Lady of Guadalupe is Miriam of Nazareth. The Queen of Heaven is the Eternal Solar Mother (or in Filianism, Her Daughter, Who is Herself), Creatrix of Earth and Heaven. The association with an historical personage in the Christian story was merely a mechanism by which Her Image was preserved in the West during the era of patriarchal Christianity. It is important to understand this, whether one accepts the Déanist position or wishes to argue against it. At least we can be clear precisely what we are arguing about.